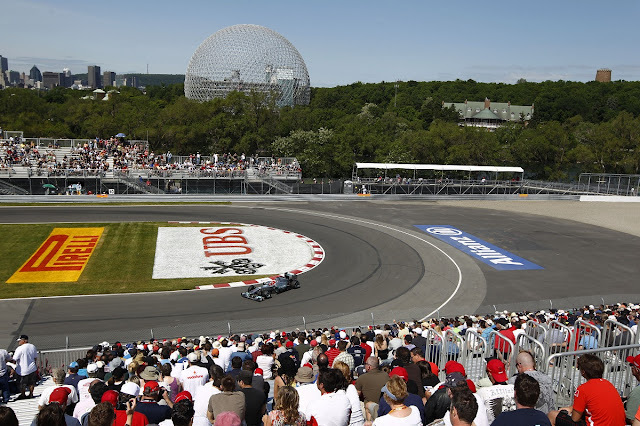 The 7th race on the 2011 Formula 1 championship calendar, the Canadian Grand Prix represents the only time this season the most premier open wheel racing series visits the North American continent. Situated in the Circuit Gilles Villeneuve on an island off the coast of Montreal, 24 drivers and cars arrived Friday to start the race weekend with two practice sessions. An accustoming site throughout 2011 is the Red Bull-Renault of Sebastian Vettel at the top of every Formula 1 chart (practice, qualifying and the race). Following the first practice for the Canadian Grand Prix, the sight of Vettel's Red Bull-Renault against the start/finish line stretch represented a rare mistake in a near flawless season. While Sebastian Vettel started the grand prix weekend on a sore note, the reigning Formula 1 World Champion immediately rallied. In the second practice session Friday, Vettel recorded the second fastest time at the Circuit Gilles Villeneuve course. “Canada is a very unique place. It’s not a real track because it’s on an island and also used for public roads." Vettel said detailing the track which has hosted the Canadian Grand Prix since 1978. The German racer compares the race course to the Australian Grand Prix's track saying "It’s a bit similar to Albert Park in Melbourne, as it’s mainly used for traffic with a second function as a race track. It’s very slippery there, the asphalt is very smooth and we saw last year that tyre degradation is huge, but it’s always good fun to go there." Racing in Canada, Sebastian Vettel shares "It’s a great race, the atmosphere is fantastic and the fans are very special"
Fully prepared with a counter-attack against the dominant Red Bull-Renault, the Friday practices shined light on a possible change to the course of the entire Formula 1 season to date. In the first practice, Mercedes GP showed some serious muscle in Montreal. The German factory team's Nico Rosberg was fastest with 7-time world driving champion Michael Schumacher piloting his Mercedes GP to a third fastest run. The track where Schmacher holds a Canadian Grand Prix record 7 wins, the driver comments “Montreal is a great city to visit and the Canadian Grand Prix is always one of those races where it feels like the whole city gets involved and creates a really nice atmosphere. The circuit itself is very much a stop-and-go scenario with much of the focus on top speed and braking." Separating the Mercedes GP cars was the Ferrari of Fernando Alonso. Alonso's teammate Felipe Massa also flew quickly around the Circuit Gilles Villeneuve for a fourth fastest time. In the second afternoon practice Friday, Alonso bettered his effort from the previous track session by placing the Ferrari at the top of the time sheet. Lapping the track at 1 minute, 15.107 seconds, Fernando Alonso was 0.369 seconds faster than the resurging Sebastian Vettel. Felipe Massa's Ferrari again was close to Alonso on the time charts just 0.494 seconds slower than the lead Ferrari Formula 1 car. In 4th and 5th, the Mercedes-Benz engined McLaren cars of Lewis Hamilton as well as Jenson Button were strong. In contrast to the strong showing in the first Friday practice, Mercedes GP team were deep down the session's results in 19th and 20th place. A new ahead of the Canadian Grand Prix weekend was the health of Sauber driver Sergio Perez after a hard crash near the end of the Monoco Grand Prix qualifying. Given medical clearance to run the Canadian Grand Prix, Perez returned to the track Friday driving his Sauber-Ferrari. Posting a very respectable 11th fastest time, it became evident to the Formula 1 rookie Perez that his recovery was not quite completed. Sergio Perez will sit out the 2011 Canadian Grand Prix and the Sauber F1 team has sought the services of last season's team driver Pedro de la Rosa to substitute. The top-four drivers and cars were separated by just a little over one second in the first practice but the gap decreased to 0.8th of a second after practice two.